One complaint that I hear from my daughter is that we always eat the same thing for dinner week after week. It’s true. I get into a dinner rut where I stick with my old favourite recipes that I could make in my sleep. Her telling me that was a bit of a wakeup call to me. I need to step outside my comfort zone or in this case, my recipe box, and try new dishes. I enjoy experimenting with different flavours and recipes. I’m the type of person who will try anything at least once. My focus now is bringing more deliciousness to our dinner table with new recipes. I think I’ve found a winner with this recipe I’m sharing today and my daughter agrees! It’s a mom-win. 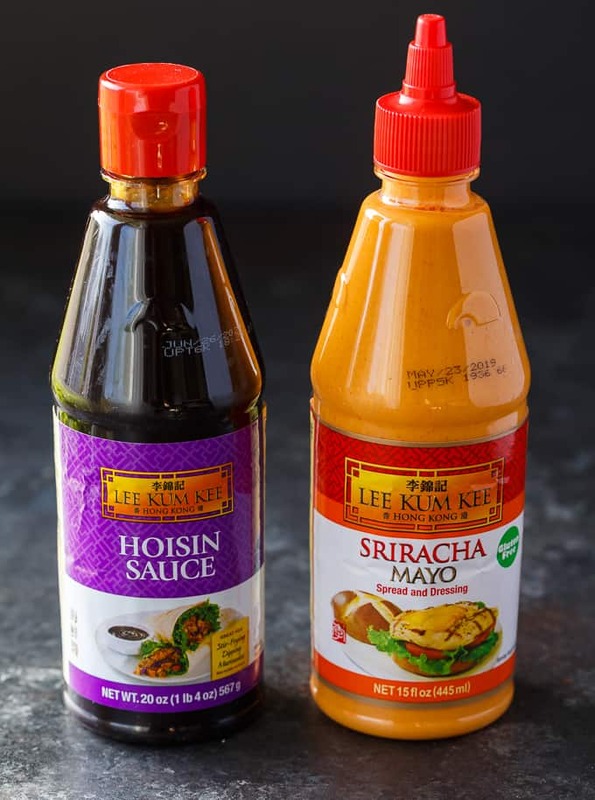 I’ve used Lee Kum Kee sauces in the past for Asian-inspired recipes I’ve made. I typically use them in stir-fries. If you aren’t familiar with the brand, let me give you a brief introduction. Lee Kum Kee makes authentic Asian sauces and condiments that are great tasting and high quality. I love that I can create restaurant quality food at home without breaking the bank (or leaving my house!). If you love Asian flavours, you must try this brand. You will love it! 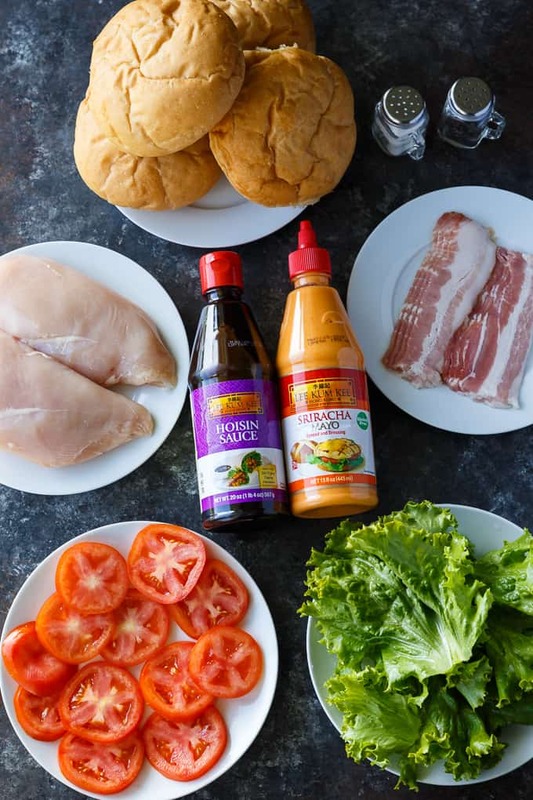 Lee Kum Kee sent me their Hoisin Sauce and Sriracha Mayo to create a recipe that incorporates mouthwatering Chinese flavours into one of my favourite recipes. Easy peasy! 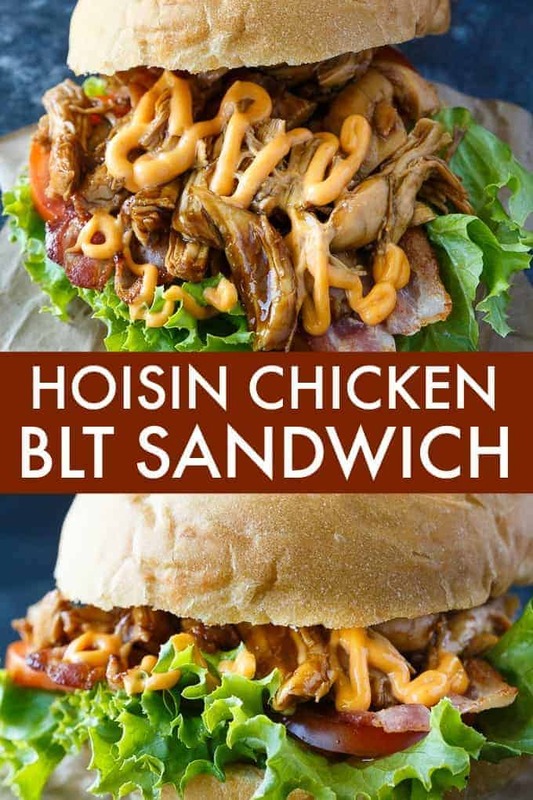 I had loads of ideas, but the recipe that I knew would be a hit with my picky daughter was the Hoisin Chicken BLT Sandwich. Who doesn’t love a good BLT Sandwich? You can probably guess some of the ingredients I choose. I mean, it’s in the title of the recipe. 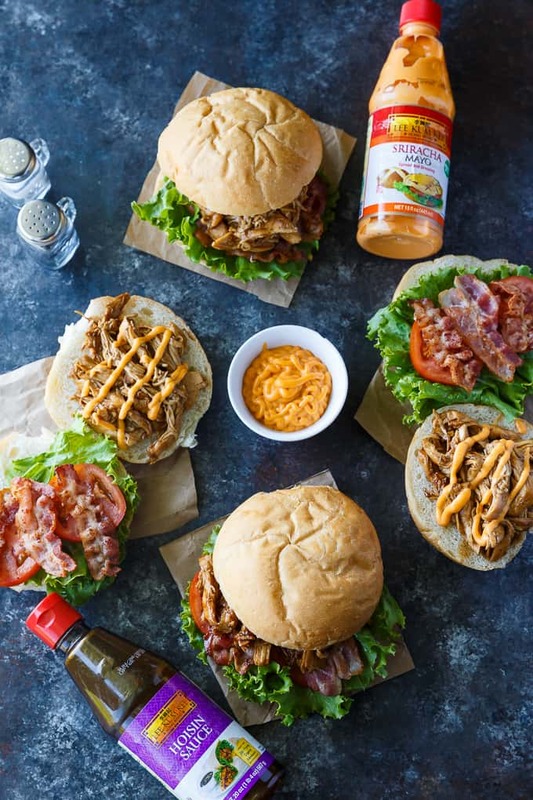 The ingredients are bacon, leaf lettuce, tomatoes, chicken breasts, buns, Lee Kum Kee Hoisin Sauce and Lee Kum Kee Sriracha Mayo. It’s a BLT with an Asian flair! Quality matters when you are choosing ingredients. That’s one reason why I think it’s important to choose the Lee Kum Kee brand. You know that you are getting something delicious that will take your recipes to the next level. 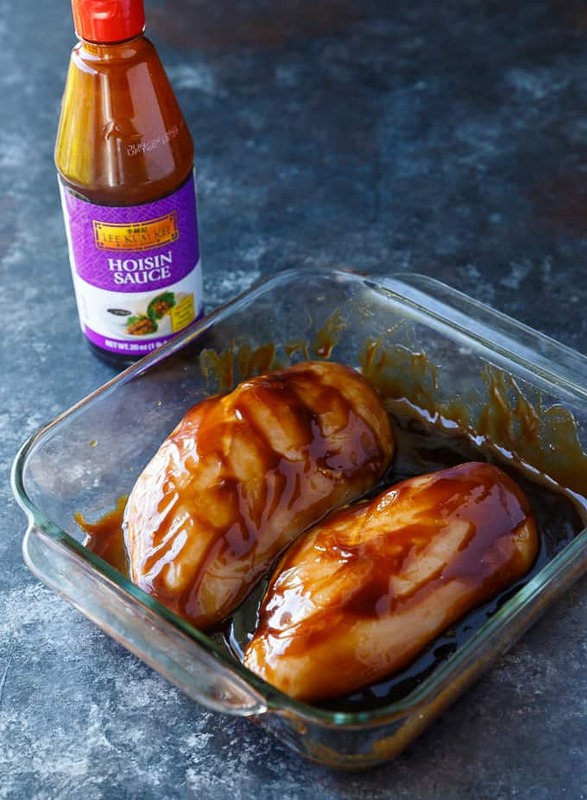 Lee Kum Kee Hoisin Sauce is used as a marinade for the chicken. It’s a sweet sauce made from spices, soy beans and sweet potatoes. I use it on chicken all the time so I knew it would work well in this recipe. The chicken bakes in the Hoisin sauce which gives it that beautifully sweet taste. After it’s baked, I shredded the chicken with two forks and tossed in the remaining sauce. I snuck a few bites to taste test and knew I had a winner! This recipe is super easy to make. 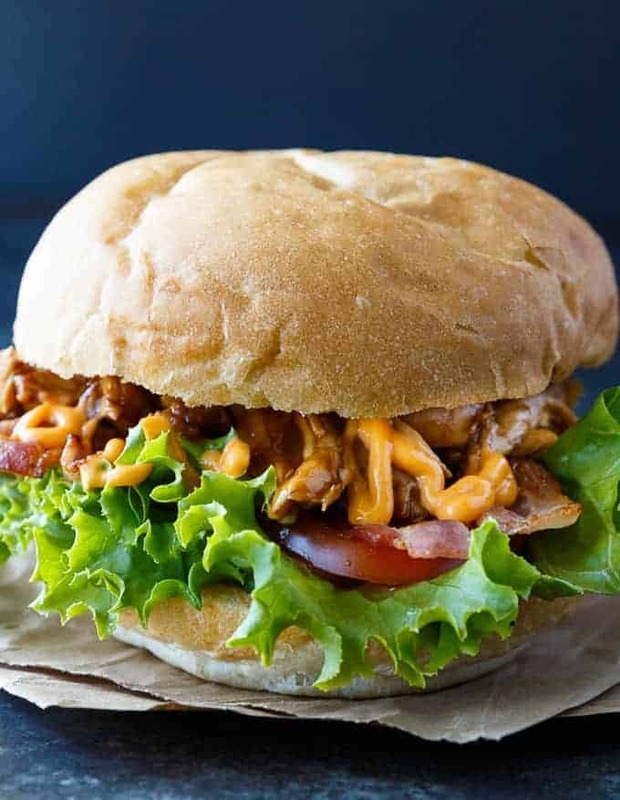 Bake the chicken, shred it and then assemble the sandwich. To complement the sweet flavours of the Hoisin Sauce, I wanted something with a little kick to it. I used Lee Kum Kee Sriracha Mayo to elevate the recipe even further. You may be thinking, “But it’s spicy!”. Yes, it is, but trust me, it pairs so well with the sweetness of the Hoisin Sauce. Lee Kum Kee Sriracha Sauce has the spicy kick you’d expect, but also a cool creaminess to it from the mayonnaise. It’s made with only premium-quality, non-GMO ingredients and is gluten-free. I use it on everything. So so good. Just look at that sandwich! It’s calling my name to take a nice big bite. This recipe makes four sandwiches, but can be easily doubled or tripled if you are serving more people. Serve for a hearty lunch or for dinner with a side salad. I was full after eating one sandwich. They are big! My friend was over when I made this recipe and she isn’t a fan of spicy foods. I told her to just try it and tell me what she thinks. 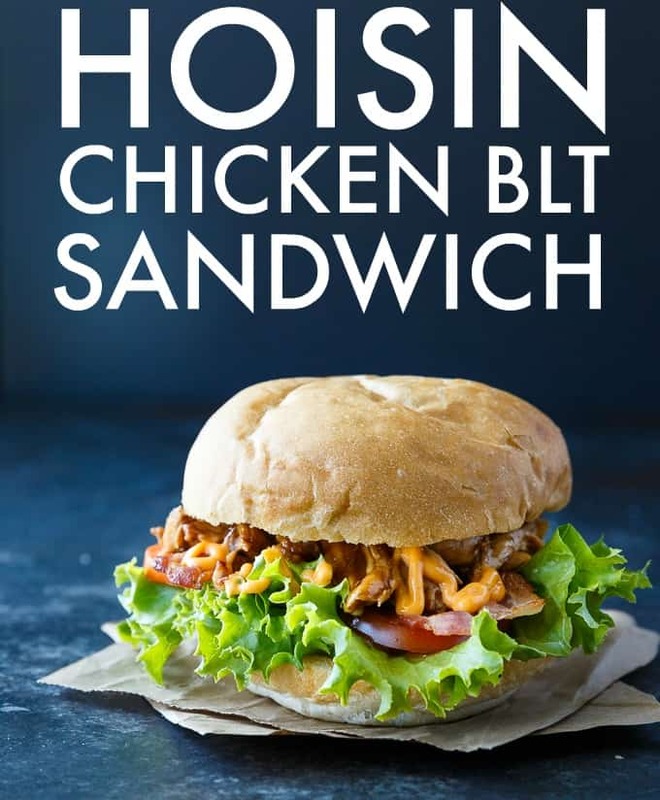 She was surprised how much she liked it and said the spiciness of the Sriracha Mayo was nicely balanced with the addition of the Hoisin Sauce. She even said it rivalled food you’d order at a restaurant. That made me feel really good. I love when people enjoy what I make. Even my daughter liked the recipe. She likes BLT Sandwiches so I knew she would at least try it. She’s asked me to make them again for dinner. I hope you’ll try out this recipe at home with your family, too! I’d love to hear how they liked it. Wow, 130 years! Lee Kee Kum is celebrating this momentous occasion by hosting a 130th Anniversary Recipe Contest. They want to inspire chefs and home cooks (like me!) to find unique and creative ways to incorporate Chinese flavours into their favourite dishes. Share your recipe and you could win HK$130,000! I can’t wait to see what you make. Good luck to all! Connect with Lee Kum Kee on Facebook, Twitter, Instagram and Pinterest. The perfect blend of sweet and spicy! 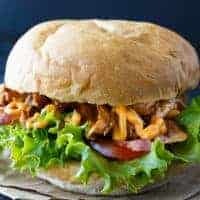 This delicious sandwich recipe is one you'll make again and again. Preheat oven to 375F. Place chicken in a casserole dish and pour on Lee Kum Kee Hoisin Sauce. Use a brush to cover both sides of chicken in sauce. Bake for 30 minutes or until chicken is cooked. While the chicken is baking, cook the bacon until crisp. Set aside. Once the chicken is cooked, remove from the oven. With two forks, shred the chicken in the casserole dish. 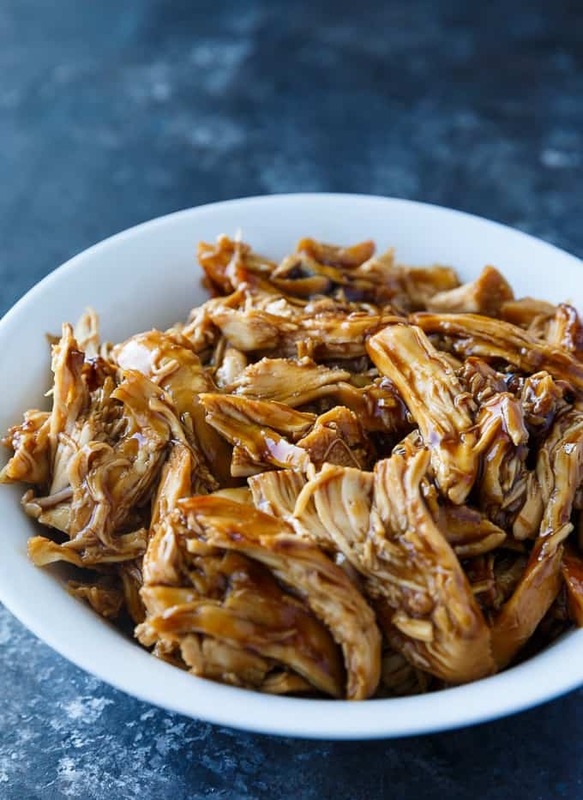 Stir the shredded chicken in the remaining Hoisin sauce in the casserole dish. 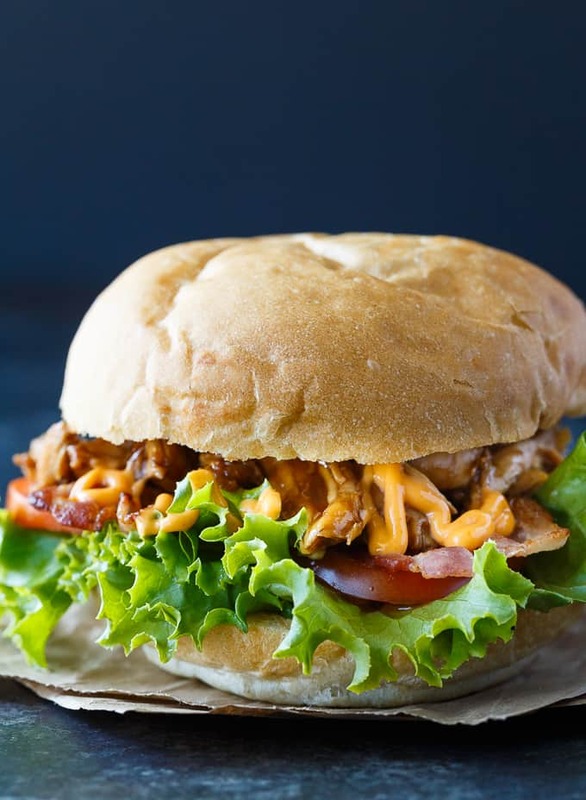 To assemble the sandwiches, Place one piece of lettuce on the bottom of each bun. 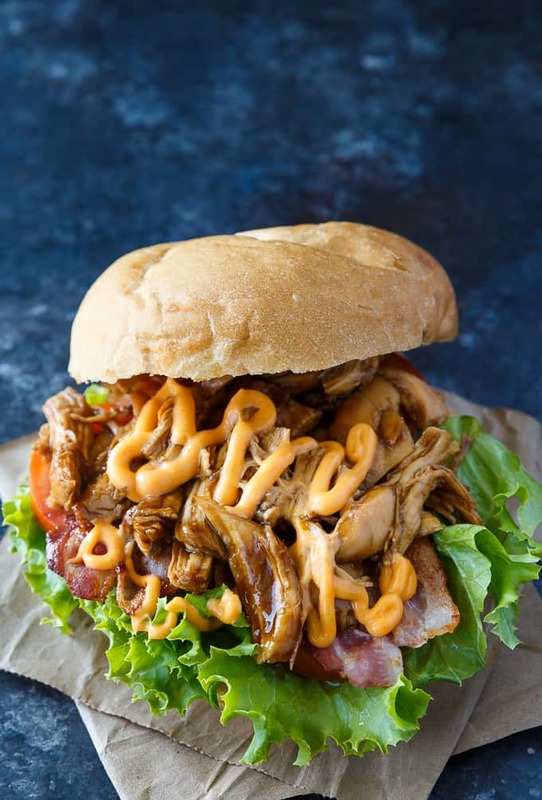 Top with tomatoes, bacon, shredded chicken, Sriracha Mayo and season with salt and pepper. Sounds really good and so different! Thank you! This looks so good! This would be a perfect for lunchtime! What a delicious idea! Not the same ol’ sandwich for sure! I’d be honored if you shared this at our What’s for Dinner party. What a great combination for a great sandwich! Thanks so much for sharing your post with us at Full Plate Thursday, we have really enjoyed it. Hope you have a great day and come back soon! Oh my, this sandwich looks delicious. Congratulations on the much deserved feature at Wonderful Wednesday.